Tigers & Strawberries » The Spice is Right IV Theme: It’s Too Darned Hot! The Spice is Right IV Theme: It’s Too Darned Hot! So, in honor of that, I decided that for the theme of the next edition of The Spice is Right, to concentrate on something that is even hotter than July–chiles! 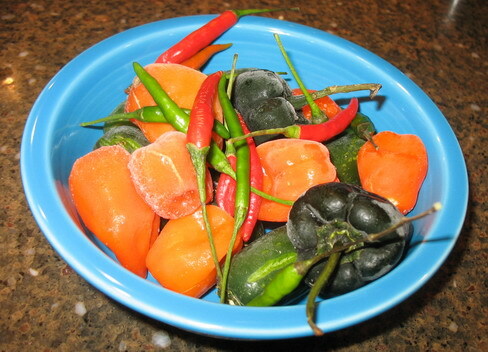 A lot of people think I am nutty for wanting to eat spicy food when it is hot, but I say that all those folks who live in tropical climates like Thailand, India, Vietnam, parts of Africa, the Carribean and parts of South American are all on to something. They know that chiles make you sweat and when it is hot, sweat is what cools you down. So, here it is–your chance to show us what you like to do with chile peppers in the kitchen. You can use chiles in whatever form you like for this event: fresh, frozen, roasted, dried whole and reconstituted, dried and powdered, dried and flaked, or ground or whatever. You can use them alone or in a blend with other flavors. You can use chile sauces, pickled chiles, or chile jam–whatever floats your boat, and makes your culinary imagination soar. As always, include in your entry your name, the name of your blog, a link to the entry and the name of the country you are from if you want me to mention it. Entries must be posted on your blog between today and midnight EST July 15th. Remember to include a link back to this post in your blog in case some of your readers see it and want to come play, too. And, as usual–if you have any questions, email me or post a comment and I will be happy to help you. Love it! I’ll be doing chilis again! My household is addicted to birdseye peppers. This one will be a breeze! Hot today, chile tomorrow. What a great idea–this should be fun. Another hard one for us!! How will we choose what to do? We have chillies just about every night. I am finally going to unveil a long-coveted recipe that I have been secretive about for a year or so. But, I am going to take an extra step and gussy it up just a wee bit more than necessary. So–stay tuned! You will see what I am up to in July! Remember–it doesn’t have to be mind-blowingly hot–it just has to have chiles in it! I have published my recipe for red chile sauce and enchiladas. I’m new to blogging though so I still haven’t figured out how to link to your site and the original chili challenge! I think they’re on to something. My dad used to swear up and down that the best thing to drink on hot days was coffee because he thought if he raised his body temp then he’d feel cooler. It makes sense in a weird way, like when you run a fever you feel like the air around you is cold.